The ideas for a unique and current Halloween costume this year seem endless. Other possibilities include: David Letterman (last show May 2015), Hulk Hogan (removed from WWE Hall of Fame for racist comments), Country exes (Miranda Lambert & Blake Shelton, Reba McEntire & Narvel Blackstock). Popular Halloween costumes throughout the years have been those related to current events. 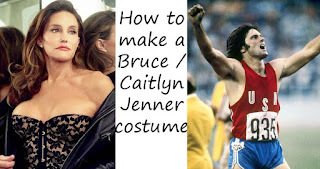 While best known for winning the gold medal at the 1976 Olympic Games, Bruce Jenner made headlines earlier this year for his dramatic transformation into Caitlyn Jenner. One of the most popular costumes this year could be a Jenner: Bruce, Caitlyn or both. To become the transgender running superstar, dress in running shorts, tank top shirt and wig of your choice. Then, place the gold medal around your neck. Wear stiletto high heel shoes and carry a fashionable sequin purse. Many books are available about this complex topic, gender transitioning, including self-help guides and autobiographies.